This has got to be one of the easiest sites to visit on Dartmoor, you nearly don’t have to get out of the car. But don’t be fooled, just because it is adjacent to a road its history dips way back into the Bronze Age. English Heritage lists Dunnabridge as a “later prehistoric pound”, and a “medieval stock enclosure”, which in effect sums the place up admirably. The map aerial picture below shows the location and topography of Dunnabridge Pound. Butler, 1991, p.54 considers that the present-day structure closely follows that of its Bronze Age counterpart. Constant use throughout the centuries has resulted in virtually all the prehistoric features being obliterated but there are feint traces of two huts and some walling within the enclosure wall. This settlement was part of the Laughter Tor and Bellever Bronze Age ‘metropolis’ and Butler, 1997, p.144 suggests that around 17 people would have lived here. To put this into context, the total population of the Dartmoor uplands and surrounding slopes at this period of time is thought to be between 8 – 9,000. According to Gover et al, 1992, p.193, the earliest written record of Dunnabridge appears in a Duchy of Cornwall document of 1305 where it appears as Donebrigge and is taken to mean – ‘Bridge by the down’, which they suggest to be spanning the river Dart. The modern-day bridge that crosses the Dunna Brook is a fairly recent addition and therefore could not be the bridge ‘by the down’. Dunnabridge Pound is clearly marked on the 1765 map drawn by Benjamin Donn, it is interesting to note that although he shows the Two Bridges to Moretonhampstead road there is no such shown passing the pound at that time. “… I came to Dunabridge pound, a large wall’d inclosure for the safe detention of Cattle, just within whose gate was a rude kind of seat, over-canopied by a single flat stone of considerable dimensions, of which the foregoing is a sketch“. This dramatic if not exaggerated sketch of 1798 shows the pound and the Judge’s Chair with a hugely disproportionate cow. This is a good example of how artistic licence can lead to false impressions. The photograph below shows the modern-day pound wall with the Judge’s Chair and as can be seen it takes a lot of imagination to find any similarity to the above picture. “…another large enclosure, measuring, according to Omerod, 110 paces from north to south, and from east to west 117 paces. The height of the wall where perfect is nearly 6 feet, the base being 3 feet, diminishing at the top to 2½ feet and having a double facing. It is probable this is nothing more and was never any other than it is now, a moor pound“. 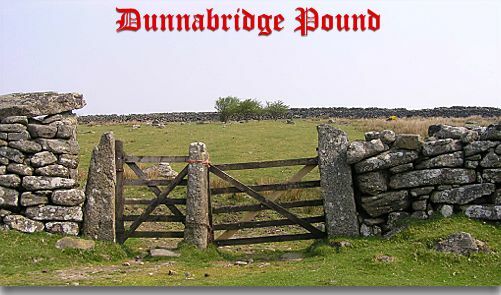 “This is Dunnabridge Pound, an enclosure of uncertain age, and in itself no way remarkable. It has, however, within the entrance a massive and very rugged structure – probably that curious remnant of the paraphernalia of the Tinners’ Parliament – the Judge’s Chair. On two upright stones about six feet high, is supported an impost having a length of eight feet. The back consists of a large slab, while several blocks are laid side by side to form the seat. For what purpose this strange seat was constructed is one of the many things that are not and never can be known. Some regard it as a cromlech, erected in the days when Dunnabridge Pound was a Celtic circle. Though the base of the wall of a former enclosure is plainly visible, and serves as a foundation for the more modern drift-pound which has been reared on its ruins, this fact affords no reason for supposing that the chair was once a monument… The people at Brownberry Farm, across the road, unhesitatingly call it the Judge’s Chair, and state that they never heard of any other“. OK, in the Bronze Age there was a small settlement and then there is a large gap of around 3,000 years and we see that the prehistoric settlement is now called Donebrigge. From the place-name it can be inferred that at this time there was a crossing place on the site. Butler, 1991, p.54, cites a document of 1342 which records that the bailiff paid 3d for a new lock to the gate. This entry would therefore indicate that by this year the prehistoric pound was now being used as an animal pound – a use that would be continued into modern times. The whole idea for the animal pound was that any animals illegally pastured within the Forest of Dartmoor would be gathered at the drifts and brought to Dunnabridge Pound. Crossing, 1997, p.120 notes how the payment for bringing stock to the pound was a ‘halfpenny cake’. Here they would wait to either be claimed by their owners and released follow the payment of a fine or, after three weeks, were taken to Lydford. During the medieval period Dunnabridge was the main pound for the southern quarter of the Forest with animals from Erme Pound being brought up after over-nighting there. Apart from the actual pound itself another surviving feature is the well, clearly any animals impounded here would need a supply of drinking water. The Pastscape Record states; “The well lies a little to the right of a stile and was protected by a granite canopy and a hinged wooden door. The door has now gone and the hollow concealing it overgrown with furze. Water was once leated, later piped, from the spring to a trough in Dunnabridge Pound. The remainder of the stream was conducted through a tunnel in the growan, almost certainly an old adit, and the well was constructed where the tunnel opens upon the roadside hollow.” – Online source – HERE. “This object will be seen immediately within the gate; there is little doubt that it is a dolmen. The wall of the pound, like that of Erme Pound is built on the line of a more ancient enclosure… Close to this interesting object at Dunnabridge a slab will be seen in which there are several circular holes, but it is now broken along the line of these. It appears probable that this once formed the side of the sepulchral chamber. In many examples of enclosed dolmens similar holes are found. If, however, the visitor should not agree with this opinion, he may amuse himself by supposing that disturbers of the peace during the times of the drifts were put to sit beneath its stone canopy, and their legs secured in these holes“. With regards to the stocks there can be no question that at one time such an item was located at Dunnabridge as a document of 1620 showed that the reeve paid out 3s 4d for the repair of the pound wall, gate, and stocks. We then come on to the debate as to exactly what and where the Judge’s Table came from. Clearly it was in-situ in 1798 as depicted in the Reverend Swete’s sketch, of that there is no dispute, but what is questionable is where it came from. 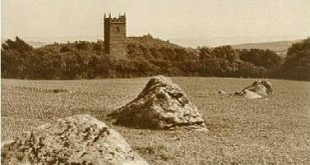 Some traditions have it that it came from the Tinner’s Parliament at Crockern tor whilst on the other hand there is another school of thought which suggests it is a prehistoric dolmen. “This stone, I had been informed, was removed by the late Judge Buller to Prince Hall; but my tenant told me that it was drawn by twelve yoke of oxen to Dennabridge, now occupied by Farmer Tucket“. Because Mrs Bray’s book has always been greatly referenced it is no surprise that different interpretations led to her referring to the Judge’s ‘Chair’ at the pound as opposed to the ‘Table’ at the farm. This would then lead to the conclusion which Crossing took which was the Judge’s Chair was the remnants of a prehistoric dolmen. Hemery, 1983, p.443, also notes the tradition but adds that the Tucketts’ maintained that a bench from Crockern tor formed the seat and that the table formed the roof of the Judge’s Chair? “It was to Dunnabridge that the relics of the presidential seat from Crockern Tor were brought late in the eighteenth century; the Judge’s Seat was erected as stocks for would-be pound breakers and the Judge’s Table as the protective canopy for the dipping well in old Dunnabridge Farm court“. Dolmen, table, chair, or stocks, what is certain is that the structure was used as the pound-keepers shelter. What is now Dunnabridge Pound Farm was the pound-keepers cottage. Hemery, p.444, lists the names of some of the later pound-keepers, starting with a family called French in late 18th century. They were then followed by Phillip Michelmore who in turn was succeeded by the last keepers – Sam and Dinah Tuckett. This couple were locally famed for their harshness and ruthlessness. Dinah was certainly not a woman to be tangled with and quite capable of matching any mans swearing. You can still sometimes come across the alternative name for the Judge’s Chair – Dinah’s Chair. Spot the difference – the photograph below was taken in 1910 and shows how much things can change in 96 years. Compare the 1910 picture with that of the one taken in 2006. The cottage behind the pound has gone, (this belonged to the ancient farm tenement of Browberry) the gates are different, the trees have grown, and the packing stones above the back of the ‘chair’ have changed. But on the whole it worn quite well considering how many visitors it gets. With such an ancient pedigree it is amazing that there are no legends of ghostly prehistoric warriors or prancing piskies attached to the pound but sadly there is not the slightest hint of any ‘legendary’ activities. Even so, next time you are sedately cruising along the B3357 and the cattle grid clatters as the tyres roll over it, cast a glance to the right and just picture old Dinah sat in her pound-keepers hut. Butler, J. 1997 Dartmoor Atlas of Antiquities, Vol. V, Devon Books, Exeter. Crossing, W. 1997, Folklore and Legends of Dartmoor, Forest Publishing, Liverton. Crossing, W. 1991 Crossing’s Guide to Dartmoor, Peninsula Press, Newton Abbot. Gray, T. (Ed) 2000 Travels in Georgian Devon, Vol. IV, Devon Books, Tiverton. Hemery, E. 1982 Historic Dart, David & Charles, Newton Abbot. Marchant, J. 1995 A High Rock Called Crockern Torr, Devon Archaeological Society Proceedings, Stroud. Page, J. Ll. W. 1895 An Exploration of Dartmoor and its Antiquities, Seeley & Co, London.